Building Our Verona: Enjoying the breeze! 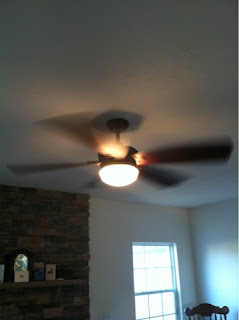 Hubby installed our new family room ceiling fan tonight. It was a bear to put up, but we're very pleased with the look and the air movement. Now, if we only had our furniture. We ordered from LaZBoy almost eight weeks ago, and we're still waiting. We can't wait to be able to sit on furniture instead of the floor. Our furniture for the room (when it ever gets here) is more modern looking, so we thought this was a good blend of modern and traditional (which is more of what our kitchen is). I'm just so happy to not be looking at a light bulb sticking out of the ceiling anymore! Oh! I really like that. Where did you get it? It is the Harbor Breeze Saratoga 60" fan from Lowes. The reviews were mixed. It got 4/5 stars, but we are quite pleased with it. Thanks! I love how contemporary it looks. Thanks! I love our fireplace. It turns out gorgeous! Beautiful fan! Is it black or wood? Thanks! The housing is oil rubbed bronze and the blades are a darker wood. I will put a picture of the fan (from the website) in the blog entry so that you can get a better representation of the colors. Looks great... I can't wait to see pictures of your furniture! i'm diggin the fan too i like that the lights are sticking out from it, looks more modern. 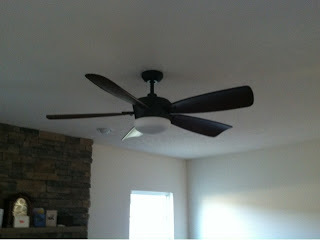 Did you guys put a ceiling fan in your morning room? I want the fan in my morning room to match the one in my family room and I'm afraid this one will be too big. I was thinking the same thing. 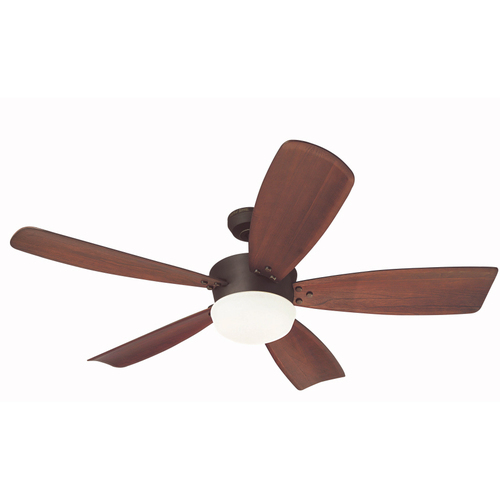 We got the fan rough-in for the morning room but I have seen a lot of light fixtures that I think would look great in there. I could always switch it to a fan later. I'm excited to see which fixture you pick for your morning room! Does that fan put out a sufficient amount of light for your family room? I don't expect to use our fan as the only source of light in there, but want to have the option if needed. Thanks! The light output is ok, but not great. I wouldn't recommend it as the only light. If I am reading a book at night, I tend to use a lamp instead. However, it is sufficient for watching tv or playing games. We have the two eyeball lights over the fireplace and a floor lamp where I typically sit. The fan is extremely quiet and we love the way it looks.